For filmmakers and video producers who struggle with sales and marketing. This book will help them build an automated marketing and lead generation system. Unlike DIY marketing efforts, which often rely on luck, this book offers a proven road map to building commercial confidence and attracting more clients. This book is for you if you run a small video production business and you want to position yourself to dominate your market, charge premium prices, and enjoy a six-figure video production empire! If you are tired of working for clients who only want the best price, this book will transform your life. It redefines how to attract clients, market a premium service, and enjoy a business with an income that hands you security and financial freedom on a plate. 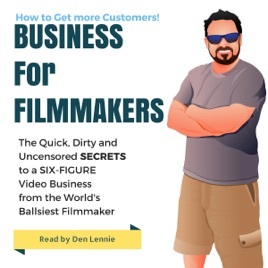 Business for Filmmakers is a blueprint for allowing a predictable six-figure income for filmmakers producing corporate videos and industrial films for commercial clients.